Next up is an opportunity that nearly everyone could take advantage of. Last post I mentioned being a bartender was one of the best ways I knew to meet people. Another one is being a server. Who goes out to eat? Everyone! With just a little bit of effort, parties on both sides of this transaction can make new friends. Allow me to explain what I mean by sharing a recent experience I had. It was late at night and Margie wanted to go shopping for Christmas gifts. I needed to get a few things written and all of the coffee shops I usually do such things at were closed. Fortunately for both of us there was a 24-hour store and restaurant across the street from each other and just a few miles from our house. I grabbed my computer and Margie grabbed her purse. I dropped her off at the store and we promised to keep each other posted. As I pulled into the parking lot I noticed there were not many cars other than mine. When I made my way inside I had to wait a few minutes for the host to come out from in back. With this time, I observed that there were no other tables seated at the moment. Right after I was seated a young lady came up to the table and inquired where my lovely lady was. Margie and I had been there a few weeks before and had obviously made a good impression. After explaining that she was shopping and I was there to write she introduced herself as Chrystle and went to grab some coffee for me. I began to set up my computer and get started. I was currently working on a restaurant review for the website Chow Down in Milwaukee. Moments later my server had returned with the coffee and took my order. I was into a groove when she returned in what seemed to be an impossibly quick amount of time. Setting down the food she inquired as to how my writing was going. I assured her it was going quite well as I took the first bite of the fruit bowl I had ordered. “What are you writing?” she inquired. As I told her I also mentioned this website and the fact that I had recently completed my second book. A second table walked in at that time and she looked torn. Excited she would be finally able to make some money, but evidently with more to say to me, she excused herself and I returned to recalling my experience at a Mexican restaurant from the day before. Just as I was getting back into a groove, lost in a zone writers love, I heard a voice from my right. “Everything still good?” I told her it was. “I have always wanted to write a book.” she said. This was obviously more of an opening than a statement given the fact she remained in front of my booth staring down at me. Deciding my moment in the zone had ended and my time to discuss writing with an aspiring author had begin, I closed my laptop and said, “Oh really?” You may think at this point I was frustrated or bothered, but if there is one thing I enjoy as much as writing it is inspiring and encouraging other people to do the same. “I wrote a story once when I was in school. The teacher said I should have it published, but my mother forbid it from happening.” she continued. She had apparently picked up on my willingness to discover what she had to say about writing. “Why would your mom do that?” I genuinely wanted to know. After responding with what seemed to be a dismissive answer aimed at avoiding opening another conversation more than avoiding answering the question I had asked, she continued. “I have a great idea for a book, but I do not think I could write it.” “I want to write a book called Single Mom Made Easy.” She went on to explain she was a single mother of several children including one with cerebral palsy. “I am in and out of hospitals a lot and it is often hard to find a qualified babysitter, but life is good you know?” Admiring her attitude I had to inquire what allowed her to think that way despite all the challenges she faced. “It is all a matter of perspective.” she said. She mentioned all she had to be grateful for and all the positives in her life. Suddenly she recalled the other table and apologetically took her leave. I was left with an idea for this post and a genuine desire to encourage this young lady to pursue what I felt would be a very helpful and life-changing book for many single parents and parents of children with disabilities. As the night went on we exchanged ideas for books and outlooks on life. I also shared my publishing experience and mentioned a few resources she could take advantage of. With a willingness to be open and a genuine interest in the person we were in contact with we both left better off. It is my true hope she decides to put her thoughts on paper and bring them to the world. It is far too often I witness people treating servers in a dismissive or worse submissive manner. These are hard-working people who are on their feet all day and have a lot to offer. By taking a few extra moments to genuinely appreciate them we could make not only a new friend, but a connection with someone who also meets many people throughout the day. As a server, you have a unique opportunity to connect with the people you serve. Inquiring about the person and not just what food they wish to consume, could lead to wonderful connections and friendships. It also will help the bottom line when it comes to the gratuity. Dinning out can be an opportunity to do more than just fill your belly with good food. With a little extra effort and care you can fill your life with more connections and rewarding friendships as well. My latest food review may be for a place you have forgotten about. If great service and food is what you are looking for click the link below to discover where I found both! Here is the link for a sandwich place right across the street from the Milwaukee County Zoo. Read what happened when Margie, my mom and I visited there. One of the things I am asked the most is “How can I quickly change my life?” Such a tricky question because your life up to this point has taken years to develop. Still, I understand we live in that nanosecond world where we expect change instantly. It is with this understanding that I have distilled my essential keys to success. These represent the pillars that most of my teachings are based on. Each one is a powerful belief that you can adapt into your life that will have a profound effect. This is a way to not only leave yourself feeling good, but to affect a great deal of change. This essential key to success is as follows promote what you love instead of bashing what you hate This does a few things for you. One, it has you feeling good because you are focused on what it is you love. How many times have we been victim of listening to someone tell us all about what they are upset about or what they dislike? This seems to happen a lot in politics. There is an axiom that where focus goes energy flows. Therefore, if you are focused on what you dislike you are actually giving it your energy. Have you every heard a celebrity say “Any press is good press.”? That is true, because by focusing on who they had an affair with, or how many times they have overdosed it keeps them foremost in our thoughts. How much sweeter would life be if we focused on what it is we loved and promoted that? Do not like rude customer service? Make sure to mention and thank the person when you receive good service. This simple change will turn your frustration into gratitude and your frown into a smile. As an added bonus, you will begin to promote what you love and you will find those very things multiplying in your life. 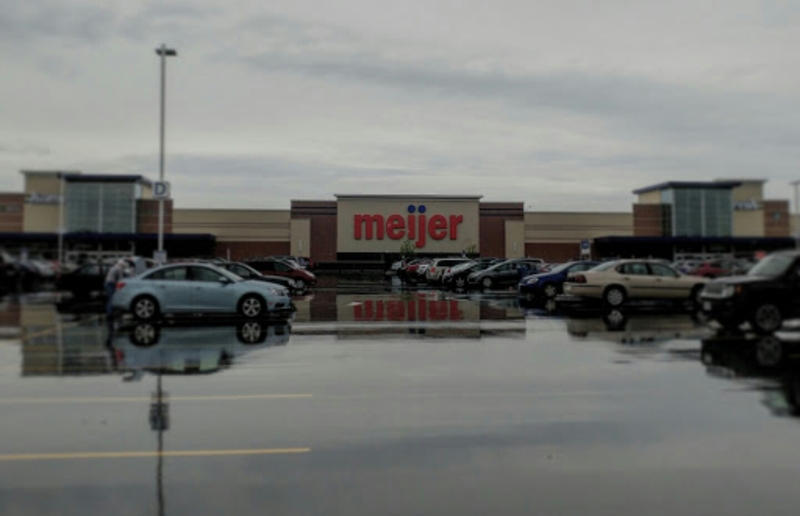 Here is a picture of the new Meijer store that opened not far from my house. For years my lady and I shopped at Walmart. Mostly because we are DJs and it is open 24 hours a day, has very reasonable prices and a pretty good selection. So then Meijer opens up. They are closer to home, also have a wide selection and are open 24 hours for our convenience. Although their prices are slightly higher, I prefer to shop there. Why? Is it because it is closer to my house? That’s convenient, but not the reason. Is it because it has a Starbucks inside? Fun, but again not the reason. These stores, although seem similar, have one major difference. This point was driven home to me today in my recent shipping trip when I returned to Walmart for something. When you enter the Meijer store, like Walmart there is a greeter. At Meijer they greet you and ask if you would enjoy a copy of the latest sales flyer. Every employee you run into says “hello” and a few even ask if you need help finding something. When we used to shop at Walmart the customer service there was so poor that is became the subject of many jokes. Cashiers not only skip any greeting or conversation, but quite often any eye contact as well. Employees can be found huddled around the front door smoking and using language that would make a sailor blush. On my most recent trip I saw roughly 20 employees. Cashiers, people stocking and even a ‘greeter’ at least in title, not actual action. None of the employees spoke a word to me and only one out of the entire group managed a smile. Now I am not putting down employees of Walmart in general, or even the ones at this store. What I am questioning is what certain corporations make a priority. Perhaps the powers that be at Walmart assume people will go there whether their people are friendly or not as long as the prices are low. Which could probably be true in several cases. Maybe they don’t focus enough on the well-being of their employees to keep them smiling? Whatever the answer may be, today was a stark reminder as to why I will continue to spend my hard earned dollars (even if it happens to end up to be a few more) at Meijer. Dignity, happiness and respect are free, but to me they are more valuable than any roll back at the store founded by Sam Walton.